FLOYD MAYWEATHER: "MANNY PACQUIAO, YES, YOU'RE NEXT!" "We only want to fight the biggest and the best out there, and Manny Pacquiao, yes, you're next," stated undefeated pound-for-pound champion Floyd Mayweather moments ago at today's press conference in Los Angeles to announce his September 17th showdown with WBC welterweight champion Victor Ortiz. Looking calm, cool, and collected as he walked down the red carpet, Mayweather smiled and waved to the fans in attendance as he made his way to the stage. Before the event even began, an angered Ortiz did not back down during the face off, pushing Mayweather back and standing his ground. Mayweather just smiled and laughed. 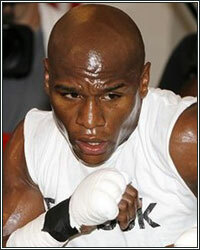 Check out what else Mayweather had to say. I want to tell Victor Ortiz thank you for stepping up to the plate and taking the tests. We only want to fight the biggest and the best out there, and Manny Pacquiao, yes, you're next! We take one day at a time. It's hard work, dedication, prayers and belief, and a good team. I have to have a lot of Mexican fans because I wouldn't be where I'm at. And to get to this plateau, and to get to the pinnacle, and to get to this level, you had to have beaten a lot of great Mexican fighters. I've been in a lot of grueling fights. I've been in tough fights. I've been in fights with big punchers. I don't have to brag or boast about what I can do. You know, some cheer for me, some bum for me. The main thing is, tune in September 17th. It's going to be another amazing fight. And like I told Victor Ortiz, it's going to be a toe-to-toe battle. I'm not going to box, I'm not going to move. Then we move on from there. My team has done an amazing job. I want to thank the media. I really want to thank the media for keeping me relevant, no matter if it was a negative story or a positive story. Every day I go out there, I lace the gloves up, I go out there, I run, I work hard. I do it for my children; that's who I do it for. All I want is the same respect that I give. I'm not a dirty fighter. I go out there, execute the game plan, and beat the guy that's put in front of me; that's my job. That's my job, is to go out there and be the best. And to be the best, you gotta beat the best that's put in front of you. As of right now, Victor Ortiz is the champion. My ultimate goal is to take the title from Victor Ortiz. Next, we move on to Manny Pacquiao, we take care of that, then we move on to the next. For 15 years, I gotta thank the fans for keeping Floyd Mayweather relevant. Thank you. I'm never going to overlook a guy like Victor Ortiz. He's young, he's strong, and he's a hard puncher. He's been in 33 or 34 fights. He's knocked down every opponent. I can't be one of the victims, so I must dedicate myself, bite down, and go out there and do what I do best, and that's to win fights.